Saudi Arabia's Crown Prince Mohammed Bin Salman was the mystery buyer of a luxury French house, according to reporting by the New York Times. The newspaper says a paper trail from a 2015 purchase leads back to him through several shell companies. The house, near Versailles, has a wine cellar, a cinema and a moat with koi, sturgeon and an underwater chamber. 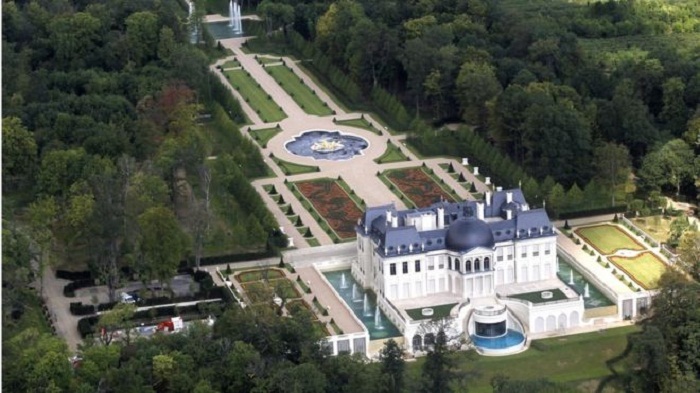 It cost €275m ($320m, £240m) and Fortune magazine called it the world's most expensive house. The buyer was unknown at the time. But the New York Times reports that documents showed the house was owned by an investment company managed by Prince Mohammed's personal foundation. The Saudi government has declined to comment on the report. A spokeswoman for the Saudi embassy in Washington accused New York Times journalists of "subjective reporting" and serving a "personal agenda". In recent months, Prince Mohammed has been leading an unprecedented drive against corruption and abuse of power and privilege in Saudi Arabia. He has had dozens of prominent Saudi figures, including princes, ministers and billionaires, locked up in Riyadh's five-star Ritz-Carlton hotel. From the exterior, the Chateau Louis XIV appears to be a 17th-Century chateau, constructed in a similar style to the nearby palace at Versailles. On closer inspection, however, this is not the case: it was built after developer Emad Khashoggi demolished a 19th-Century building that had previously stood on the 57-acre (23-hectare) site and is modern inside. According to reports, its fountains and air conditioning, as well as lights and music, can be controlled by smartphone. A local official told the New York Times: "The idea is tacky, and then once you visit it isn't." In 2015, Prince Mohammed reportedly bought himself a yacht from a Russian businessman for $590m. The New York Times has also reported that he was the true buyer of the Leonardo da Vinci painting Salvator Mundi, which was sold earlier this year for a record $450m (£341m). It will be displayed at the new Louvre Abu Dhabi and although its buyer was anonymous at first and was then thought to be a different Saudi prince, the paper says it was actually bought by Prince Mohammed.